All great and wonderful things should have another go! 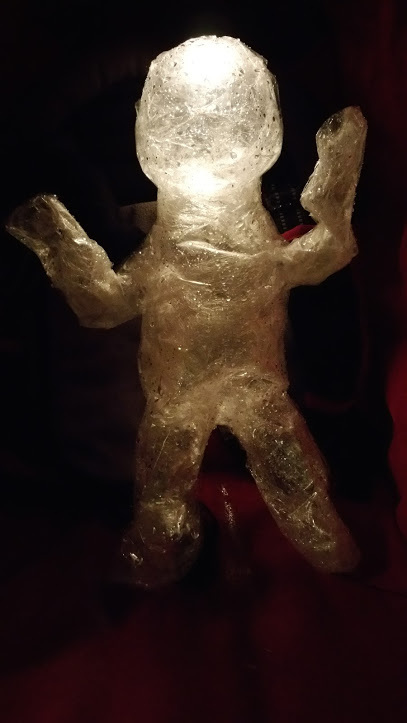 Here’s my packing tape ghost from last year. I will definitely be making another this year (along with the spider egg sacks.) Happy Halloween! Oh, I had fun making this! 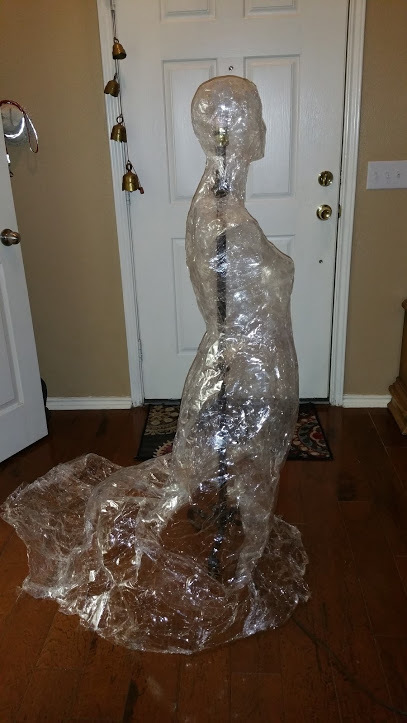 I saw this “packing tape ghost” idea in a pin, but the instructions given seemed nearly impossible. The instructions I saw wrapped the ghost with packing tape sticky side out and then went back and re-wrapped it sticky side in. I knew from the get-go I was NOT going to attempt this with these directions! I have to thank Pintrest for the idea, if not the instructions. This is the sort of thing I see a photo of, and then skip whatever instructions there are and wing it myself. I made a 30 foot spiderweb this way…but I won’t give you instructions for that. My spiderweb was purely a project to do by sight and it took me several hours to complete. My instructions for my spiderweb would basically be: look at this and then recreate it out of string. Lame instructions indeed! This ghost however, I can easily help you recreate! First you are going to need a form. I contemplated having my husband tape me, but figured I might not enjoy the process. I was right: DO NOT USE A LIVE PERSON FOR THIS! It takes hours to finish this and plastic wrap and tape do not breathe. If you tried to use a person 1. they would forever hate you for making them stand still this long and 2. they would pass out from the accumulated body heat. You do not want to be calling 911 when you have made your live “dummy” sick with this project! I didn’t have a form. I thought I might stuff a dress with newspaper and tape that. I am glad I didn’t. You could try that but it would come out lumpy and dorky and not especially cool. I decided to go down to my local craft store and see if there was anything cheap I could use. 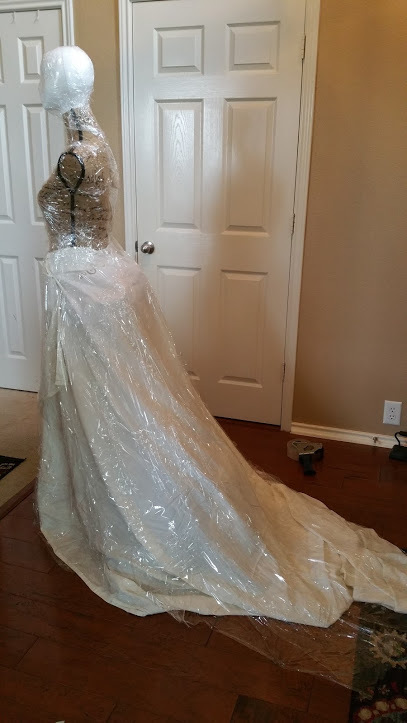 If you have a dress form- use it! 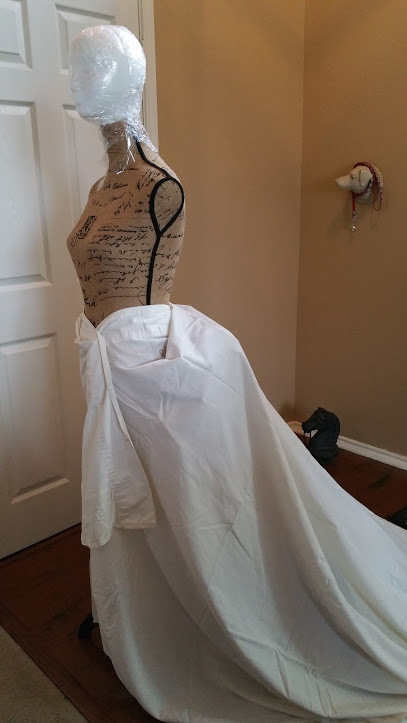 If you are like me and don’t want to shell out a couple hundred dollars for a real adjustable dress form there are alternatives. My extra large spider (on my homemade web) caught the ghost! There are plastic dress forms on hangers (they are cheap!) used for store displays sold online. The limiting factor to this is super high shipping and for me: I came up with this idea too close to Halloween to wait for something to come in the mail (I got the idea for this two days before Halloween.) If you live in a large city you may be able to find a local supplier that sells forms to clothing stores. Look up mannequins. I couldn’t find anything close by, so, that was out too. I decided in a last attempt (I was completely ready for this to be a “next year” project) to go down to our local Hobby Lobby…Success! Hobby Lobby had decorative dress forms for sale and I had a 50% off coupon. Hobby Lobby has an app and you can just show them the online coupon and they will take it…so don’t buy anything you don’t have a good coupon for! Like a lot of things in Hobby Lobby: most of the dress forms were broken. We had to find some up on shelves. So if you are going to try this, and want to buy the dress form: make sure what you are getting is solid, if it isn’t make sure you talk to the manager and get a discount. (Hobby Lobby will give you incredible deals on things that are slightly damaged. Our local Micheal’s craft store does not have these. I did not try JoAnn’s fabric.) I would guess that this type of mannequin is sold in many different hobby/craft/fabric stores, you are just going to have to look around. Second you need a Styrofoam head or a large detached doll head. I had to pass on a baby doll I borrowed from our neighbor. The hair was in the way and would have made cutting the form off the doll difficult (did I mention I made a ghost baby, too? I used a bald baby doll. This has a lot of applications!) 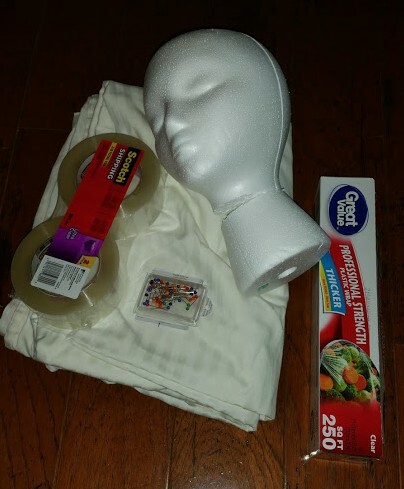 I got my Styrofoam head at Hobby Lobby, as well. There is a section just for Styrofoam in the back of the store (not with the floral foam.) I cut part of the neck off so the head sat correctly on the body. Scissors for any excess you decide to remove as you are going. Pins to hold the skirt of the dress to the form. Now it’s time to make the ghost! Now that you have completely covered your form (twice) with tape it is time to cut the layers off of the form. This is why plastic wrap is superior: you don’t want the tape to be stuck to your form and it makes this a semi-easy, doable project! 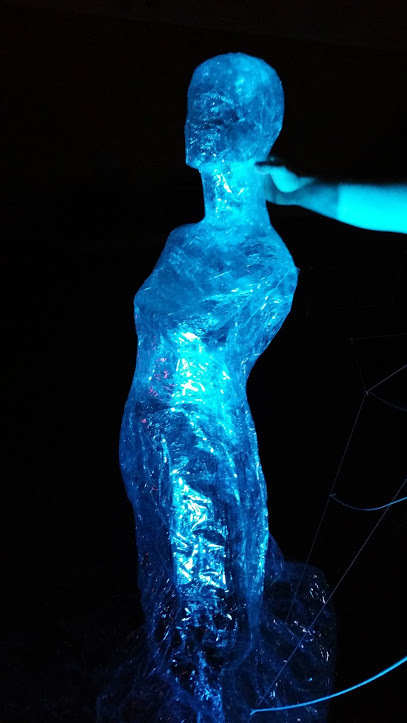 Once you have cut the tape off of the form and removed it from the mannequin you created (with the dress form and head) you need to tape it back together. When you cut this off I suggest looking for the fastest route across the taped area that does not cut the face of the ghost. Sit down, align the areas that need taping and slowly (and carefully) tape your ghost back together. The two layers of tape will give the form enough strength to keep its shape. You need something inside the ghost to keep it upright. I suggest buying a piece of rebar, drive it into the ground and slide a taller piece of pvc pipe on it (I think plain rebar would poke through the tape.) Put your ghost over it (making sure the pvc has been cut to rest in the top of the ghost’s head.) To secure it: I suggest getting some landscape pins from a home and garden store. Keep your packing tape handy. I will tape over the landscape pins this year (once they’re through the ghost and in the ground.) The pins tore through her dress because it was pretty windy last year. Extra tape should prevent that. Plus: You don’t want this to fall over or blow away. We had no time to work on her support this year so my husband just took the ghost and put her on a large floor lamp with the shade removed. It wasn’t quite tall enough so the skirt buckled (not permanently, but it would look much more impressive set up at the right height.) but more importantly: ours blew over! We got home to find the tape had touched the light we had aimed at her…and it was smoking. We were very lucky the ghost didn’t catch fire in the front yard! Another idea (that would cost more but be fun) is to create a wooden hangman’s support to hang her from. 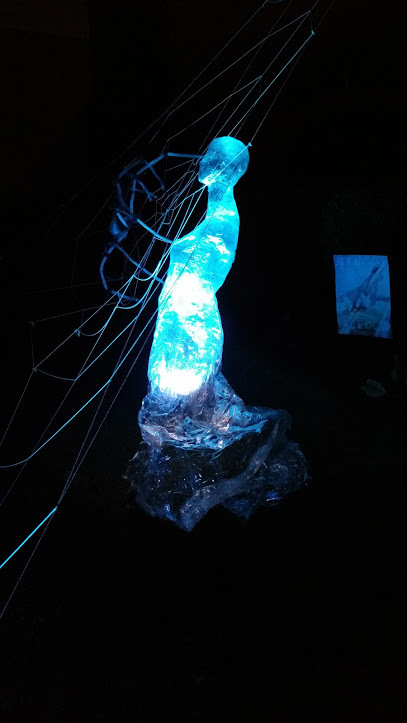 You would still need to tie her down though, because she doesn’t show up with out a lighting source and would need some stability to keep her from flying all over…this is on my “to do list” for next year! To light your ghost you need a black light flood light. You can try other kinds but we have found the incandescent ones work much better than newer types of bulbs. The drawback to incandescent bulbs is that they get hot and the tape cannot be: on, over or very near, the light bulb. Just try and be aware of this when you light the ghost. 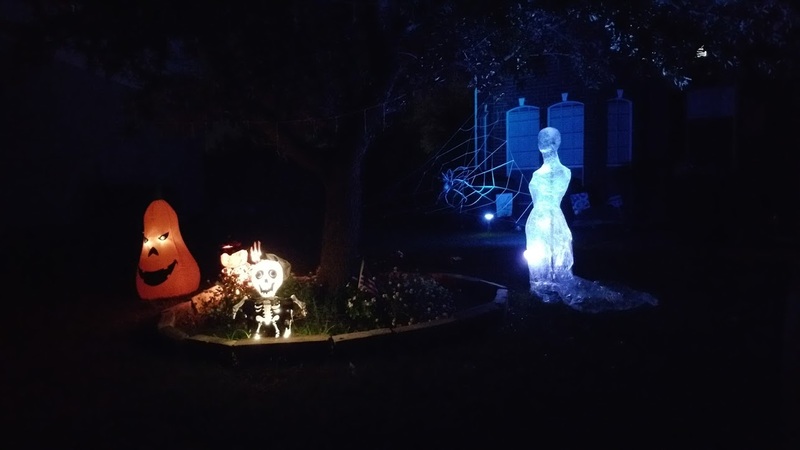 This ghost is almost a neon sign in your yard. 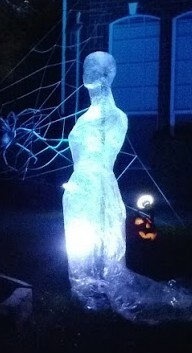 People can see this from down the block and will come to your house just to see the packing tape ghost. It turned out to be just as impressive as our 30′ spiderweb that I made from string, a year earlier. Also, expect that some teenage no-goods may find your ghost very attractive and try and bring her home with them. I would not leave the ghost in the yard unattended, as we had a few older kids lurking about on our dark street, late at night, that magically decided to go home after I brought the ghost in. The lighted ghost baby that we took around in a stroller. I also made a ghost baby and intend to make spider egg sacks (with balloons as a base form.) We put the ghost baby in an old stroller and lit it with a flashlight. A stroller, by the way, is a brilliant addition to trick or treating! We had the storage below the stroller for: a garage door opener/keys, water bottles, snacks for the kids, an area for extra candy (bring shopping bags to keep the candy separated), and a place for the costume parts that my kids always shed as we walk around. Go big or go home, right? Anyway, the baby was a fun way to bring a part of our display with us. This is my most liked and visited article. If you liked this I bet you would like my second most trafficked article about why you should never use rock as an alternative to plant material. I talk about the heat island effects and how rock (and lawns) contribute to an out of control heat building and (your) physical energy wasting problem of modern life in: please don’t rock your yard! And if all else fails, follow my idiotic gardening experience to resolve some crazy itchy arms from the field! An Extra Itchy Case of The Gardening Stupids! Extra fruit and you don’t know what to do with it? Make a shrub! Keep exploring. I have plenty of fun stuff to share! Thanks so much for visiting!